As part of a longer term plan to add lighting to the coaching stock, I needed to dismantle a Bachmann Mk 1 coach. As always this was more fiddly, and stressful than one would like. As models have got more detailed, they have also got more delicate. 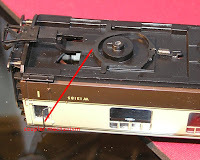 So here for my failing memory, as well as anyone else out there - here is my guide to dismantling Bachmann Mk 1s. Remove the water pipes on each end they can just be pulled out with pliers or tweezers, if you just remove the lower fixing they can be gently bent clipped around the side of the coach. Turn coach upside down and remove each bogies by unscrewing the centre screw. 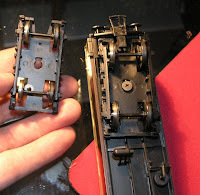 There are clever, but delicate little coupling assemblies below each bogie, these can be carefully unclipped. Three screws can now be seen and removed. and the seating slid from the chassis. When you come to reassmble, please note that the middle screw is not in the centre, so the base and the floor need to be lined up - if you put one in the wrong way round, the middle screw can not be done up. Also note the bogies fit on with the 'gap' pointing towards the coupling socket. Great Advice. Your easy to follow guide has saved me loads of time and stress. Thanks! Ditto, every Bachmann seems to differ!